You are here: Home / Health & Medical News / What is Chagas Disease? According to an article in the Journal of the American Medical Association (JAMA), in a Los Angeles clinic treating patients with heart failure, about 20% of Latin American patients have Chagas disease. Chagas is a parasitic infection that is endemic in 21 countries in Central and South America and affects an estimated 6-7 million people worldwide. This disease is one of several so-called neglected tropical infectious diseases that have significant worldwide morbidity (the incidence of a disease) and mortality. It can, as the JAMA article suggests, lead to severe health complications. But in the US, the disease is relatively rare, though incidence is starting to increase. This increase represents an opportunity for the medical community to learn about this disease and find ways to help patients who are infected and to thwart the risks of potential infection of others. What exactly is Chagas disease? 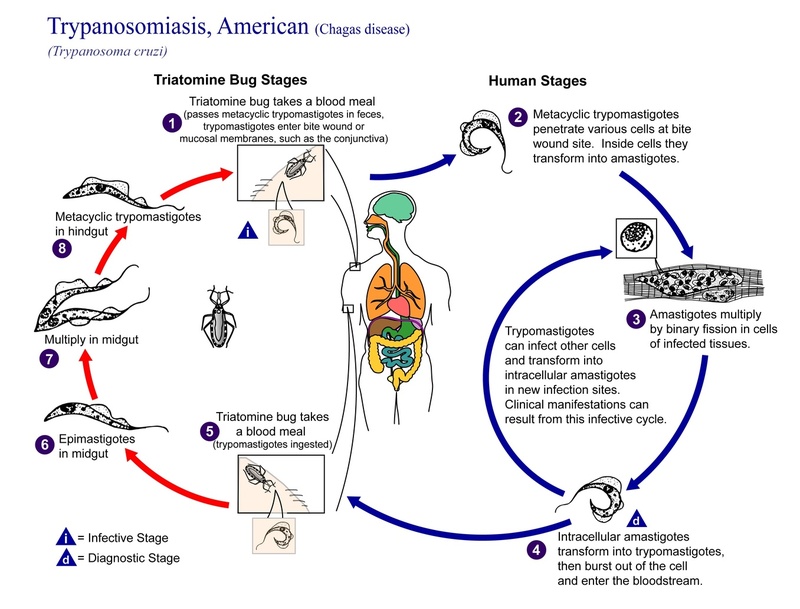 Sometimes called American, or South American, trypanosomiasis, Chagas is an infection with the protozoan parasite Trypanosoma cruzi. People can become infected by the blood-feeding triatomine bug, the feces of which contains parasites that contaminate the bite wound or mucous membranes which leads to infection. This isn’t the only mode of infection. An infected mother can pass the infection to her developing fetus. The parasite can also be ingested, either by consuming infected animals or drinking fluid contaminated with parasites. There have been reports of infection from consumption of juice, prepared from acai berries or other fruits or imported sugar cane, which is contaminated during processing by immature triatomine bugs carrying the parasite. The parasite can also be acquired from infected human blood products and tissue through blood transfusion or organ transplantation. Once inside a human, parasites enter the bloodstream or the lymphatic system (composed of lymph nodes and vessels that contain a large bulk of immune cells), from which they are distributed throughout the body. While these parasites infect many different kinds of humans cells, they preferentially infect muscle cells in the heart and those lining the gastrointestinal tract. This leads to the destruction of host tissue, resulting in chronic inflammation and scarring of the heart and gastrointestinal tract that gives rise to the heart disease or gastrointestinal problems that occur in about 20%-30% of those infected. The factors which make some people develop long-term symptoms while others do not are not well understood. The life cycle of Trypanosoma cruzi, the causal agent of American Trypanosomiasis. The life cycle is complex, involving parasite development in both insect and mammalian hosts. CDC/Alexander J da Silva, PhD, Melanie Moser. People in poor rural regions in Central and South America are particularly at risk for acquiring Chagas disease, especially if they live in substandard housing which allows entrance of the insects that carry T. cruzi. In heavily infested dwellings, adult insects can breed, giving rise to immature insects that become infected with the parasite. Another risk factor is how close homes are to a reservoir of infected animals. The risk is lower in the US. In the last 60 years, fewer than 30 people have been reported to have caught Chagas disease in the US. The overall number of people with Chagas in the US is estimated at approximately 300,000, most of whom acquired it outside the US in countries where Chagas is endemic. These patients were likely infected many decades before cardiac or gastrointestinal symptoms arise. It is estimated that the health-care associated costs in the US and Canada related to Chagas disease is nearly US$119 million annually. In the US, there are many animal reservoirs that can carry T. cruzi, such as raccoons, opossums, ringtails, skunks, armadillos, coyotes, bobcats, badgers, foxes and rodents such as woodrats, squirrels, rats and mice. However, domesticated animals such as cats and dogs can also harbor the parasite. Triatomine insects are found in at least 28 states in the US, mainly in the southern regions. Recent cases reported in the US have been linked to outdoor activities such as camping, hunting and gardening, leading to insect exposure, rather than the more traditional risk factors usually associated with insect exposure in endemic countries. Since the disease can be transmitted through the transfer of infected blood and tissue, these must be screened for the presence of the parasite. Increasingly, Chagas is detected through these screening procedures, which is a challenge for the medical community because Chagas is a relatively rare disease in the US and many healthcare providers do not have experience with the management of this problem. What happens if you get Chagas? People with Chagas can remain asymptomatic for long periods, which means they can unknowingly bring the disease into other regions of the world. Increased international travel is the main reason that there are more cases of Chagas appearing outside of regions where it is endemic. Those at the early phase of infection with T. cruzi can be completely asymptomatic or have nonspecific flu-like symptoms such as fever, chills or body aches which are temporary. Some infected people may develop localized swelling at or near the site of the insect bite that contains parasites and causes a local inflammatory reaction. After the acute phase passes, infected people usually remain asymptomatic and only develop the chronic symptoms decades later. Regarding treatment, there are two anti-parasitic medications (called benznidazole and nifurtimox) that can be used for both those who test positive and are asymptomatic and those who have symptoms of chronic disease. The drugs can have significant side effects, and patients on these medications need close follow-up with their physicians. These drugs are not routinely available in the US and must be obtained by physicians through the Centers for Disease Control and Prevention (CDC). Although there are research labs working in the development of newer and safer anti-parasitic agents, there is little in the way of large-scale investment in anti-parasitic drug development by the pharmaceutical industry. There are currently no vaccines available for the prevention of Chagas disease. The way to prevent Chagas disease is to avoid contact with triatomine bugs. Spraying programs for insect control are also important, as is avoiding the close proximity of animal dwellings to houses or the cohabitation of humans with potentially infected animals. Detection and control of animal reservoirs and screening of people living in geographical areas at risk for Chagas are also important. Bradford McGwire receives funding from The American Heart Association, Fulbright Commission and The Ohio State University.